Hello from the Central Coast of California. Computers and Astronomy have been hobbies of mine since I was in high school. Anyone remember a DEC PDP-10, or punch cards? The first computer I built was a Z80 based machine with a whopping 16K of memory and a tape drive I build from a standard cassette recorder. I even had to make my own keyboard out of an old teletype machine. Does this sound like the story of walking 5 miles to school, up hill, both ways? I was very fortunate to have Carl Sagan as a visiting professor when I was in College. I was able to spend some significant time with him. As a result I have been a member of the Planetary Society almost from it's inception, and have several telescopes I use to do my own star gazing. I am president of a small real estate development company. One development that I designed that is currently selling new homes and the street names were based on space as the theme. One street was named after Carl Sagan, Sagan Way. 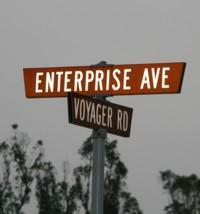 My favorite intersection is Voyager and Enterprise. Other streets include Celestial Way, Io Court, Lunar Circle, and Mercury Avenue. I tried to get one street to be named Gallafrey, (I like Dr. Who), but the County didnâ€™t approve that one. I've been crunching Seti units for almost 8 years now. It is an honor and pleasure to be able to make my contribution to this search. Thanks you to everyone who is contributing their time, money and of course computer time to this most worthy of endeavors. I strongly belive that there is life out there. With space, as we know it, being infinite, then the possiblity for live on other planets is also quite vast. I also like a challenge. I firmly belive that that the correct definintion for impossible is something that has not been done yet! So let's do the impossible.